Well I do hope that everyone is enjoying themselves as much as I am! Surely this is what the internet was invented for! Mind you, I must say that picking fabric is the most difficult part of quilting, and I've never made a scrappy quilt, so this is a new adventure for me! 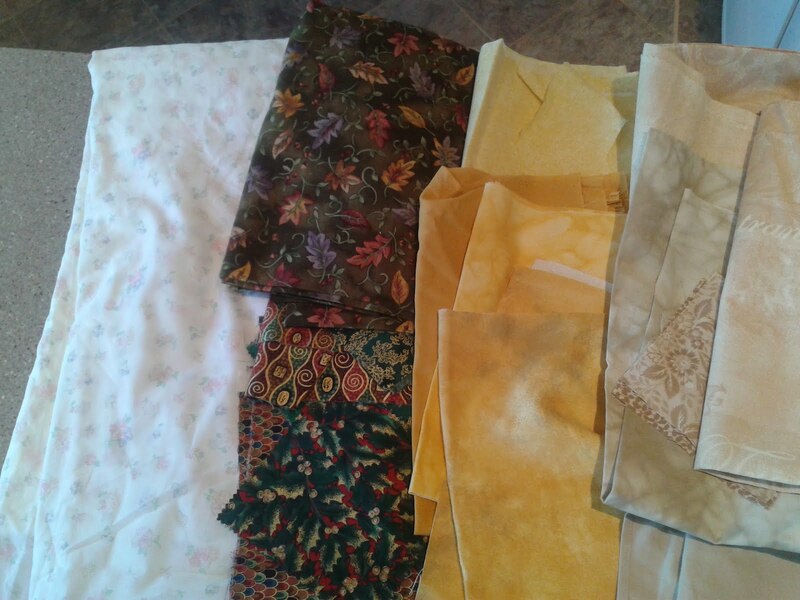 So I've spent half the morning dithering over my stash and the attic room now looks like one gigantic jumble sale, BUT I have now chosen a bunch of fabrics for the backgound, dark, medium and light elements of the quilt which I am really pleased with. Hurrah! I'm not giving myself the option of changing my mind and I'm heading to the kitchen for a coffee. This going to look gorgeous. I just wish I had the courage to go scrappy! Bilbo will be proud of you! I just threw dinner in the crockpot. I made need a bit of a nap - being an insomniac, have yet to get some sleep. 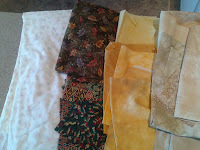 Love your selection of fabrics - good for you, no changes! Beautiful choices! I just picked mine and did some cutting and updated my blog with the pictures. Now it's off for groceries and I'll look forward to catching up with everyone later! Very nice selection of fabrics, m'dear. Sorry I haven't been able to join you today but as you know, domesticity of the horticultural kind had to take priority. Don't change your mind. Those fabrics look great together. Progress - and An Announcement!